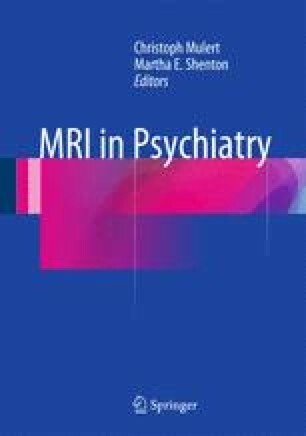 In vivo imaging using magnetic resonance techniques helps to investigate one of the most common psychiatric diseases worldwide: substance dependence. Its individual development and maintenance is assumed to result from an interaction of various psychological, genetic, social, and substance-inherent psychotropic conditions that determine neuronal correlates of addicted behavior. Chronic substance abuse engages various neuroadaptive processes in different neurotransmitter systems, such as dopaminergic, glutamatergic, serotonergic, and opioidergic neurotransmission, which will be discussed in detail. Further, magnetic resonance imaging (MRI) methods, like functional magnetic resonance imaging (MRI), positron-emission tomography (PET), proton magnetic resonance spectroscopy (1H-MRS), and structural MRI, have enabled researchers to get crucial in vivo insight into major mechanisms of drug dependence, i.e., heightened drug-associated reward processing, abnormal functional connectivity predicting impairments in learning, decision-making, and the magnitude of drug craving. Likewise, decreased striatal dopamine synthesis capacity and downregulation of dopamine D2/3 receptor availability have been correlated with drug craving and treatment outcome. In this chapter, we focus on recent neuroimaging studies that contribute to the research of individuals depending on alcohol, heroin, cocaine, or other psychostimulants. Finally, MRI studies on the functional and structural basis of pathological gambling as a related behavioral addiction are reviewed.